In certain areas of the world snail bait is one of the most common causes of accidental poisonings in dogs. The toxic active ingredient found in most slug and snail baits is metaldehyde. Snail bait or slug bait usually come in pellet form which your pet can find very attractive because it resembles dog kibble. The snail pellets are sometimes combined with molasses, apples and bran which is added to attract the slugs and snails. Unfortunately this also attracts your dog to them. Snail bait is also available in liquid and granule form, however, if you use it in this form dogs may walk on it and later lick their paws. They may even eat the dirt containing granules or liquid. It is in your dog's best interest not to use snail bait around your yard. Don't make a snail bait meal your dog's last meal. How much Snail Bait is Dangerous to my dog? A very small amount of snail bait is fatal for dogs. Approximately 1 teaspoon per 4.5kg/10lb of bodyweight will cause death in fifty percent of ingestions. It is critical to get veterinary attention immediately if you suspect snail bait poisoning. Your dog could die within four hours of ingestion. Get to a vet as soon as possible. Every minute counts. Try to stay calm and before heading off to the emergency room remember to grab the packet containing the snail bait so your vet can check the active ingredients. If your dog has vomited at home it may also be useful to take the dog's vomit with you to the vet for testing. Your vet may induce vomiting and may use a stomach pump. Activated charcoal is often given to absorb toxic substances. It reduces absorption in the gastrointestinal tract. If the bait has already reached the intestine, enemas may be given to wash the poison out. Your vet will monitor your dog's temperature and he may put him on IV fluids to flush out the poison. The muscle twitching will usually be treated with a muscle relaxant such as diazepam. Your vet may have to anesthetize your dog until seizures are controlled. High fever is common and is associated with the muscle twitching. Once the muscle tremors subside the temperature usually lowers. Your dog will be hospitalized for monitoring and supportive care of further symptoms. Prognosis of metaldehyde poisoning depends mainly on the amount of snail bait ingested and the time elapsed in getting treatment from your vet. The quicker you get to the vet the better chance of survival for your dog. If your dog is not successfully treated death usually occurs within 4-12 hours. Dogs that initially survive the poisoning may develop liver disease in 2-3 days. Recovered dogs may suffer from memory loss, temporary blindness or diarrhea. Remember… it's not only where you spread snail bait on the ground, you also have to be careful where you store it. Dogs like children are notorious for getting into things they shouldn't. Always store all chemicals in a safe child and pet proof place. Is there a Pet Safe Snail Bait? Speak to the people at your garden centre regarding pet safe snail killers and repellents. There is a product called Sluggo, a snail and slug killer which is said to be non toxic to pets. READ THE LABEL YOURSELF, thoroughly! You can also purchase various snail traps. Are there any other alternatives to kill snails? Another alternative available are predatory snails called the Decollate Snail. 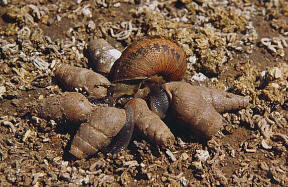 Decollate snails attack the common brown garden snail and the snail's eggs. They will also eat decaying plant material, which keeps them fed when they can't find snails but they will always prefer pest snails if they are present. Copper barrier tape forms an effective barrier to protect plants from slugs and snails. The tape is self adhesive and is wrapped around the rim of plant pots or containers. Slugs and snails are deterred from crossing this barrier due to a tiny positive electric charge that is given off by the tape.